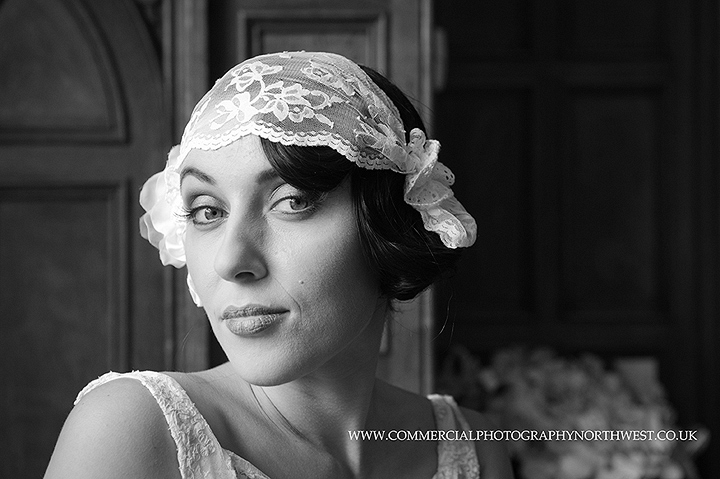 Back in the summer I was at Arley Hall, shooting wedding dresses. A dirty job, but someone’s gotta do it right? Wearing another hat, I photograph weddings as well as all the commercial work you see here, and in the ten years of doing so I’ve made a lot of friends in the wedding industry. I first met Erica Stacey a couple of years ago, when she was just launching her wedding dress business – we were on neighbouring stands at the Tatton Park Wedding Show. So the chance to create some images of some of her latest collection was too good an opportunity to turn up. I’ve also met and become friends with plenty of other photographers, including Johnboy Wilson, whose wife Melanie runs the boutique The Case of the Curious Bride in Sale. Melanie stocks Erica’s creations, along with other vintage styled pieces, and provided the dresses for this shoot. Melanie also creates vintage headwear under the label Ivory Tuesday, which also featured in the shoot. The shoot was also a chance for me to work with some good friends and fellow photographers – Johnboy Wilson, David Stubbs and Andrew Billington (all great guys and fine wedding photographers) – in trying out a few new lighting ideas. I’ve already featured some of the images from this shoot on my wedding photography website, and the blog English-Wedding.com ran an article on it recently. To discuss your own project, please give me a call on 07766 815703 or fill in the contact form at the top of the page and I’ll be in touch.